I knew I always loved you. Though, there was a time in my life when I was told to replace you with an oily, yellow-colored spread, which tried but could never match your palatable perfection. There was a time when to spread your sweet creaminess over a piece of toast was a decadent treat, indulged upon sparingly to limit consumption of your delicious fats. There was a time when doctors told me if I ate too much of you, I would need cholesterol-lowering drugs to prevent you from damaging my heart and arteries. But now, the time has come that I have learned to embrace you, in all your golden glory! My ancestors not only consumed you in copious amounts, but revered you as sacred! They were free of nearly all the degenerative diseases that plague our current nation. So, why are we so afraid to walk in their footsteps? When did eating real foods in their natural form become substandard to modern, industrialized creations merely masquerading as the foods they emulate? Butter, you are not the enemy! I am here to stand up for you. And I am here to tell the world what I have learned — that when it comes to optimizing your health, butter is better. Not only is it better than cheap substitutes made from (rancid and toxic) polyunsaturated vegetable oils, there are few foods that are as nourishing to your body and as beneficial to your health as is butter! If you are no stranger to the real food movement (you know, those crazy people who drink milk from cows instead of from factories, grow their own grub in the backyard, and house glass jars of various fermenting concoctions in their cupboards, among other oddities to the general population), you ought to be relatively familiar with the holy grail of foods that is butter, and likely already include generous portions of it into your diet. But! Butter is full of artery-clogging saturated fat, won’t that give me heart disease?! Comforting, isn’t it? Wonder how many other lies you’ve been told by the (albeit well-meaning) doctors and nutrition “experts” of our time influenced by this fallacy? But! Those saturated fats in butter are detrimental to your overall health — they are the worst kind, aren’t they? You know that poor aforementioned, thoroughly washed-and-waxed-by-the-FDA brain of yours? Any guesses as to what naturally composes over 60% of it? …give up? Yes, your brain is largely made up of the very substance that most nutrition “experts” of our day are advising you to avoid. I don’t know, maybe their fat-starved noggins have been deprived of the stuff for long enough to fail to comprehend this blatant flaw in their dietary doctrine! Brain power isn’t the only benefit of healthy saturated fats. Yes, that’s right — I said “healthy.” Butter not only contains a hefty helping of crucial vitamins A, D, and K, but it also provides the saturated fats necessary for absorption of these important nutrients. In other words, these are fat-soluble vitamins. Processing plants sprinkling synthesized versions of them into your breakfast cereal, which is then dunked in a bowl of skim milk, ain’t gonna cut it. There are a myriad of health benefits associated with vitamins A, D, and K, but that is perhaps for another post entirely! Suffice it to say these are crucial for proper development in youth and essential for sustained health and longevity. Saturated fats are also what half of every cell membrane in your body is composed of. Sound important, yet? Saturated fats are vital to bone, intestinal, and heart health, and are necessary for the utilization of essential fatty acids. The somewhat recent nutritional trend of incorporating EFA’s such as Omega-3 into the diet, fails to recognize this key component to making use of of these very important nutrients. The inclusion of saturated fats in the diet is in fact vital to our health, and butter is an ideal source for them! But! Butter is chock full of cholesterol, and everyone knows you need to avoid that! Sorry, this one’s a myth too. I know that’s a tough one to swallow. But hear me out! Cholesterol is actually…(get this)… an antioxidant that protects your body from free radical damage that can cause cancer and heart disease — seriously! It also is a large component in the molecular structure of myelin, the support system for every cell and nerve fiber in your nervous system. It is also crucial to intercellular communication. It is also responsible for providing strength to your cell walls, and basically preventing them from falling flat on their faces. It’s a big deal, that cholesterol stuff! Think of it this way– mother’s milk is extremely high in cholesterol (as well as saturated fat). And shouldn’t that tell us something? Cholesterol is essential for brain development and function (remember what those are made of?) as well as crucial for the developing nervous system, for reasons mentioned earlier. It’s in there for a reason! Keep in mind, however, that not all cholesterol is created equal. Well, actually I take that back. Not all cholesterol by the time it is consumed will serve these same important functions for your body. Cholesterol can become quite damaged by exposure to extreme heat and oxygen. This damaged, or oxidized, cholesterol is what we do want to ditch from our plates because it can lead to plaque buildup in the arteries and damage arterial cells. Fear not, however — the bad stuff is easily avoided! Damaged cholesterol is largely found in processed, FAKE foods, such as powdered eggs and milk. Don’t think you consume those too regularly? Powdered milk is added to reduced-fat and skim milk to add more body and substance to the product. But you don’t see that on the label, now do you? Never trust fake food! Seems logical, but it’s far from the truth. The short and medium-chain fatty acids in butter are not stored as adipose (fat) tissue, but are instead utilized for energy. Are you as shocked to find out the truth about this stuff as I was? Are you as determined as I am to buck the butter-bashing dogma of dietary “gurus” and get REAL with your relationship to food? I hope like me, you’ll become a Believer, once again! This is a great summary of why butter is as awesome as it tastes 🙂 Just read through your posts & love ’em, keep up the good work! Yes I have returned to butter, also. Couldn’t hack that margarine anymore. Not that I use either in gargantuan amounts. But it does taste MUCH better! Thank you for this post. I often feel alone in the world of butter defense. I have been eating similar to Nourishing Traditions and the Body Ecology Diet for several months now, and butter has become my diet staple. Maybe you should write in defense of the good, old fashioned, farm fresh egg, too. Another super food that gets a bad rap (as well it should, if it is one produced in a hatchery). I have eggs, butter, garlic, and broccoli almost everyday and I am certain my dangerously high “bad” cholesterol has dropped significantly. I will have it tested soon, just to prove to doubting friends that butter is not bad. The average American diet is bad. Don’t blame it on the butter! I got the greatest laugh when I went into my former specialist’s office, thirty pounds lighter, and he was of course pleased that I’d lost weight. And of course it was after I’d followed his boring, disgusting low-fat diet, right? Nope, Atkins, baby! All the meat, eggs, butter and cheese I could stand! Especially OMFG for the love of all that is holy, BUTTER, glorious butter! He said my heart stats would be horrible. But every single one of them were better. Every. Single. One. I had regular checkups with this guy for a condition unrelated to my diet, so he got to see me over a long course of time. Visit after visit, he couldn’t believe that I had the heart stats of a healthy 25 year old, despite eating the very things I wasn’t supposed to. Especially all that butter. At the time, I smoked, too. I should have been on death’s door. Yet I was his healthiest patient, by far. It wasn’t long before he started recommending low-carb diets to his patients. He told me that nearly every patient was most delighted with having butter again, above meat, cheese or eggs. Good to hear the Good News is getting out there . Iv always been a Butter Believer and a diet food sceptic. I have never seen a thin friend holding a diet drink, only overweight ones. Emily! I just came to your first post to see when you started this blog and lo and behold, I run into Lori!! Frank and I are friends with Lori and Drew in RL! We went to the same chiropractor a couple years back! I am on a strict high fat, diet. Which makes me not depressed. Or I should say, I eat food. Not what food eats. I can’t believe I used to eat “healthy” but now I am fitter than ever eating decadence. You are dead on that butter is better. I wish it was as cheap as Blue Bonnet though! I also think that high fat diets prevent cancer. If you don’t eat sugar (or simple carbs at all) the cancer has nothing to eat. Your body cannot convert fat into sugars (careful of too much protien though. I loved you post on butter. I have used real butter my entire life. Growing up we ate the real thing too. I have always known that real butter is good for me and I never ate fake butter because I know it is not good for me. 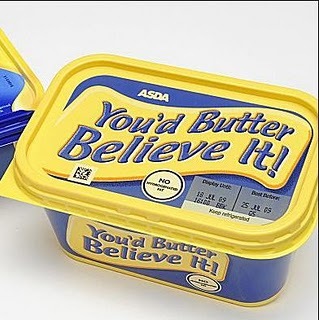 I always knew that the food industry was spreading a lie so they could sell their processed butter like spread. I was lucky, growing up because we ate real food, and a lot of the fruits and veges came from my grandfather’s organic garden. Great post! Keep up the good work.